Spring has sprung on the farm! This weekend has been one for the record books! We have had a large portion of our snow cover melt with the warm weather and large amount of rainfall. When the snow melts this quick we get a lot of water flowing down the hill and it takes the path of least resistance. We have been hard at work helping the water navigate it´s way off the driveway. A couple culverts are still frozen so we have built small channels for the water to follow to bypass it. Who said playing in the mud is just for kids? 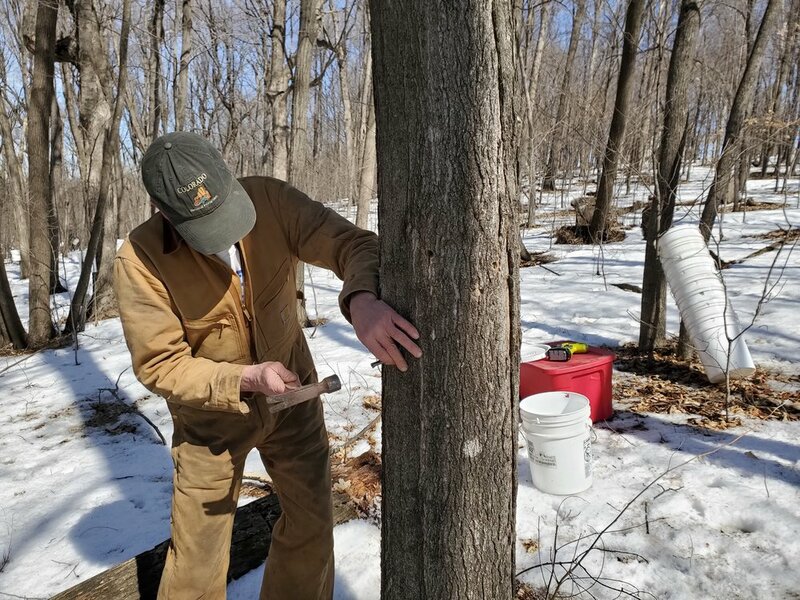 We have also started tapping trees and collecting sap for maple syrup! We are excited for this years syrup season. We have over 70 taps placed which is more than we´ve had in the past. We plan to start boiling syrup today, 3/18/19! The pups have been loving this weather. Warm sun mixed with snow and mud is a recipe for a nasty mud pup filled with happiness! The full pond in the back is lookin´ gorgeous under the sunset. Reminder- itś not too late to sign up for our 2019 CSA season, check out our CSA page for more information! We look forward to keeping you updated on the 2019 season as things progress!